Over the years my husband and my two sons have always given me honest input regarding any food that I have prepared. A very long time ago, it is now decades, Cranorange Coffee Cake (click on link for recipe card) became our favorite dessert after our Christmas dinner. I had acquired two recipes for this moisty, flavorful, colorful cake. 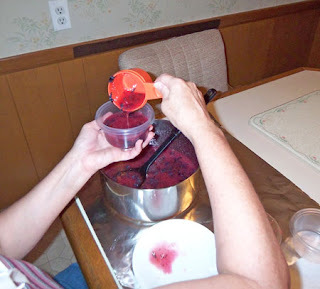 One recipe used Cran/Orange Relish and the other recipe used Whole Berry Cranberry Sauce. I have learned that the best time to purchase the Cran/Orange Relish is during the month of November. Grocery stores do not stock a large inventory. However, if this particular item is not located, there is always Plan B. Use the Whole Berry Cranberry Sauce with an addition of 2 tsp. of Orange Extract stirred in before using. Currently, the cake that we will enjoy on Christmas Day is baking in my oven. After cooling, it will be wrapped in heavy-duty foil and placed in the freezer. This scrumptious cake is moister if it has been frozen and defrosted before serving. After defrosting tomorrow night, the almond flavored icing will be drizzled on top. A slice of Cranorange Coffee Cake will be enjoyed with a scoop of vanilla ice cream on the side. This is also a delicious cake to serve to your guests on New Year’s Day! The bottom of my family’s cookie container is reached quickly whenever our container is filled with Snickerdoodles. (Click on link for recipe.) This yummy cookie with a cinnamon topping is mouth-watering! One batch yields about 3 dozen scrumptious treats. Snickerdoodles are a great dessert to place on a Christmas/Holiday buffet dessert table. Bake these cookies a day or two before you plan to share them, because they do not freeze well. Consider baking an extra batch for your family to enjoy! Otherwise, place the baked cookies in a spot where family members will not find them easily. Once they are located the cookies will be devoured and enjoyed! Snickerdoodles can also be a gift from your kitchen mailed (click on links for hints) to a family member/friend that lives a distance from you. These homemade treats are easy to make and taste absolutely delicious! After enjoying an absolutely wonderful Thanksgiving holiday with my family, December suddenly arrived. Celebrating the holidays is a wonderful time of the year and it does require preparation. You and I both are deciding on the special gifts to choose for family members and friends. Sour Cream Sugar Cookies are absolutely delicious! Cookie cutters are used after the dough is rolled out. My family has never tasted a better sugar cookie! The baked and cooled cookies can also be placed in the freezer for your family to enjoy later. Soft, delicious, chewy homemade cookies! Craisin Raisin Oaties, Sour Cream Sugar Cookies or Chocolate Chip Cookies all are yummy! 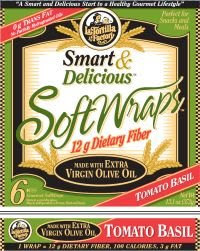 They always hit the spot for any occasion and they can be packaged and mailed to a delighted family member or friend to enjoy! In the past few days my oven has been used daily. Quick Breads such as Butternut Squash Bread and Apple Bread have been baked, cooled, wrapped and placed in my freezer ready to be defrosted and eaten during this holiday weekend. Today, pies were prepared. While the Butternut Squash Custard Pie was cooling, the Cherry Pie found its place on the oven shelf. Mincemeat Pie followed. 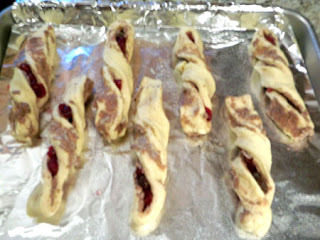 Tomorrow, the Cranberry Breads will be baked. Happy Thanksgiving to you and your families/friends! Whenever these easy and quick to make favorites are found in our fridge, they disappear swiftly. 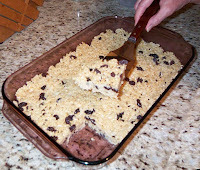 Raisins are a great addition to a Rice Krispies Bar! It’s all about the raisins! Over the years I have learned that doing a little prep work before starting to make the Raisin Rice Krispies Bars is very useful. I use a glass baking dish (about 9” x 15”) and spray it lightly with PAM. Wipe off the excess PAM with a paper towel. The required ingredients need to be ready to use. Making Raisin Rice Krispies Bars requires working quickly. After measuring out all of the ingredients and before lightly pressing the mixture in the glass dish with the bottom of the measuring cup, place a pinch of margarine on the underside (bottom) of the measuring cup. Spread it lightly with a paper towel or piece of crumpled wax paper. This allows for easy non-stick pressing of the mixture in the baking dish. 1. In a 6 qt. pot (large pot) melt 4 TBS. Margarine over Low Heat. 2. Add in 4 Cups Miniature Marshmallows stirring until melted. 4. Add in 3 Cups Rice Krispies Cereal and stir. 5. 1 Cup Raisins are added. 6. Then, add 2 ½ Cups more Rice Krispies Cereal and stir. 7. Place mixture (will be sticky) in the baking dish and press lightly. 8. Cover top of baking dish with Glad Wrap and refrigerate for an hour. 9. Cut into bars and place in a covered container to store in fridge. For more of my family favorite recipes check out my A Tasty Thought website. 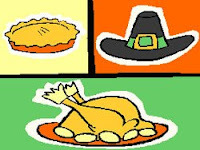 Currently, it is about one and one-half weeks before Thanksgiving! While browsing through the grocery store sales flyers, advertised specials are spotted. This is a great opportunity to purchase the baking staples that will be used in the next few weeks for preparing food for the holidays. The brands and sizes that I use of Flour, Sugar, Chocolate Chip Morsels, Light/Fat Free Chicken Broth, Spices, and Evaporated Milk will be on sale. Yes, I also clip, save and use coupons. Do you? How sweet to use a coupon on an advertised special! No Time to Make a Crust for an Apple Pie? No problem! 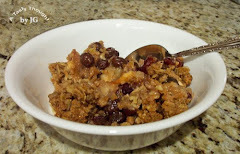 Apple Crisp (click on link) does not require a pie crust! It is easy to prepare. Plumped Raisins & Craisins are mixed in with the apple slices before the oat/cinnamon topping is added. While this delicious dessert is baking in your oven the aroma of apples and cinnamon will flow from your kitchen. 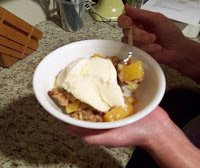 We enjoy warm or cold Apple Crisp with a small scoop of vanilla ice cream. This scrumptious easy to prepare dessert has been a family favorite for many years. Have you baked Apple Crisp this fall? This is a BIG shout-out to my son’s buddies!!! I feel very flattered that you checked out my cooking blog! He mentioned sending “a few people” the link. I noticed it in the traffic pattern! Thank you for visiting! Many of you have sampled the foods in this blog at one time or another. Currently, you live a distance from where I reside, but I know that you all have big appetites! An Egg Cheesy Raisin Muffin, Fantastic French Toast, Pan Seared Scallops, Baked Haddock, Sherbet Punch and Simply Delicious are quite easy to prepare and taste great! Click on these links and easy to follow directions for yummy food awaits you. Happy Cooking and Stay Healthy! Do you have a Slow Cooker or a Crock Pot? Have you used it in the past few weeks? My answer to both questions is YES! Quite often I use my West Bend Slow Cooker when I am at home working on other projects. The meals prepared in this small appliance have few instructions, take little prep work/time, and taste absolutely delicious! Chili can be prepared on top of the stove, but if the ingredients are placed in the cooking pot of a Slow Cooker or Crock Pot and simmer for a few hours, the resulting dinner is very tender and full of flavor. The instructions for Red-Hot Chili are simple. Brown about 1 lb. Ground Beef in a frying pan and then place the browned meat in the bottom of the cooking pot of the Slow Cooker/Crock Pot. Place the contents of one 14.5 oz. can of Diced Tomatoes on top of the browned beef. Drain, rinse in cold water and drain again the contents of two cans of Red Kidney Beans. Place the Kidney Beans on top of tomatoes. Sprinkle desired amount of dehydrated chopped onions and chopped parsley on top. Then, sprinkle on 2 tsp. Chili Powder (or desired amount) ½ tsp. Garlic Powder and ½ tsp. Oregano. Pour Tomato Sauce (two 15 oz. cans) evenly over top. Place lid on. Set the temperature on High for 2 and ½ hours. Then, reduce to Medium for ½ hour. When it is ready to be served stir the scrumptious appetizing Red-Hot Chili before placing into bowls. Your family will know dinner is ready. We enjoy a bowl of Red-Hot Chili served with a spoonful of Fat Free Sour Cream on top. Add a slice of Oatmeal Bread – Yummy! This week many readers have clicked on Sherbet Punch. Punch bowls will be filled with the frothy colorful orange punch at Halloween parties! This easy to prepare delicious beverage is made with 7-Up Diet soda and orange sherbet. Many months ago I shared my family's favorite punch with you. This tasty beverage can be enjoyed at many different functions during the year. When the weather gets a tad chillier I enjoy baking dinner in my oven. The aroma of tomato sauce combined with herbs coming from my warm kitchen smells great! 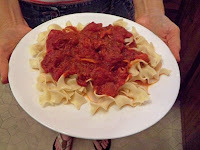 An entrée made of noodles and tomato sauce is always eaten quickly. Do you find that this is true in your family? Manicotti is full of flavor, but it does take time to fill those shells. However, Ricotta Rollups are easy to prepare, because Lasagna noodles are used rather than shells. A dinner of delicious Ricotta Rollups served with a salad and Parmesan Toast (click on links) is scrumptious! It is always wonderful to locate an old favorite recipe, substitute one ingredient with a similar ingredient and then discover that the new component made the recipe taste even better! Earlier this week I baked a batch of Bran Muffins. (Click on link for recipe.) Sauteing & Baking Extra Light Olive Oil was substituted for the vegetable oil. These easy homemade delicious Bran Muffins containing raisins tasted so good. Trying something new certainly worked well!!! I will always use the Olive Oil when baking those delicious, moisty, and light muffins. Columbus Day Weekend! Cool nights and warm sunny days! Apple season in New England! They blend together. One item on my list of “things to do” this weekend will be to bake Appetizing Apple Bread. (Click on link for recipe.) By baking two loaves my family will enjoy one loaf and the other will be cooled, wrapped in foil, labelled and placed in my freezer to be enjoyed later this month. Moisty Appetizing Apple Bread is absolutely delicious for dessert or as part of breakfast served along with Lower Cholesterol Scrambled Eggs. Sometimes, Plan B is used in preparing dinner. Two nights ago I was planning on making Grilled Haddock. However, the afternoon just flew by and the Haddock had already been purchased. As much as my family enjoys Grilled Haddock, it was much easier to bake the tender fish in my oven. Our dinner of Baked Haddock with the addition of microwaved “Baked Potatoes” and Salad was quick, easy, nutritious and tasted delicious! Plan B worked very well! Hearty nutritious delicious breakfasts have been on my mind! My family enjoyed a quick and an appetizing breakfast this morning. The needed ingredients were Raisin English Muffins, Sliced American Cheese and Eggs. In a small non-stick skillet fry an egg, turning egg over once. I usually pierce the yolk after the egg is in the pan (less messy to eat later). At the same time lightly toast a Raisin English Muffin. After the muffin is toasted place a slice of American Cheese on one half. The fried egg is placed on top of the cheese. Then, place the muffin’s other half on top. Melted cheese and raisins taste so good surrounding an egg. Yummy! This breakfast is easy and delicious! At breakfast time on Saturday morning the aroma of cinnamon filled my kitchen. To my family it was a clue that we would be enjoying Fantastic French Toast (click on link). Preparing French Toast with Pepperidge Farm Cinnamon Bread is very easy. Keeping in mind that two egg whites equals one whole egg when cooking, I prepared a breakfast with less cholesterol. It is also one of our favorites. After we had eaten, the extra slices of delicious Fantastic French Toast were packaged and placed in our freezer. On a busier morning they will be reheated in the microwave. 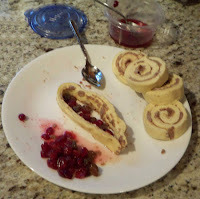 One year my son had a wonderful suggestion – use Pepperidge Farm Cinnamon Raisin Bread rather than plain cinnamon bread. I used the idea. Ah, that is so tasty! Does your family enjoy French Toast? Surprise them on a weekend morning with Fantastic French Toast. As fall approaches and the mornings become a little chillier my round container of Quaker Old Fashioned Oats is opened and the contents are used often. Creamy Cranberry Oatmeal is a hearty, nutritious, delicious breakfast. Some mornings I prepare it with Raisins rather than with Craisins. The container empties quickly. One day as I was walking down the cereal aisle at our local Costco I discovered a very large box of Quaker Old Fashioned Oats. You might ask - would I ever use that many oats? The box just looks so large. Well, that hefty wonderful box contains two individual plastic bags holding a staple of my kitchen. I have learned that purchasing the large box works so well. After I open one of the generous bags, I pour the oats into three smaller containers and place the lid on the top for storing. No longer do I wait for oats to go on sale at our local grocery store and purchase a few containers. Recently while visiting a family member in NYC we stopped at a Costco in Brooklyn. The two level Costco was fascinating. I never realized that some of the stores were that large! After peering into other shoppers’ carts a smile appeared on my face. Many consumers had that large box of Quaker Old Fashioned Oats in their carts. Some scrumptious cookies, pancakes (click on links) and muffins require oats. That large box is used quicker than you might believe. The mornings are a tad chillier now that September is here. Earlier today a warm bowl of Creamy Cranberry Oatmeal tasted so good for breakfast! After enjoying the leisurely pace of summer, it is time to get back to cooking with oats. Tomorrow morning the aroma of Awesome Oatmeal Pancakes with blueberries will fill my kitchen. Yes, any extra pancakes will be frozen and enjoyed at another breakfast. Have you made them? Oatmeal Pancakes are delicious and with blueberries added to the batter on the griddle – Yummy! On our daily walk earlier this week my husband & I stopped to chat with some neighbors. Very generously, they offered us a few large, red tomatoes from their garden. Who can resist fresh tomatoes? The next day’s lunch flashed before my eyes! Thinly sliced pieces of a fresh tomato placed on a grilled cheese sandwich before the sandwich is grilled – that is a great sandwich! The next day the toasted oatmeal bread was delicious containing warm melted cheese and heated tomatoes. Try this great quick scrumptious sandwich on the weekend! Is It Blueberry Season, Yet? Yes, blueberry season is definitely here! The cultivated, ripened, juicy blueberries are now ready to be picked at local farms in Western Massachusetts! Our delicious winter supply of the blue, tasty, nutritious berries were prepared and frozen yesterday. This morning we enjoyed a hearty breakfast of Blueberry Oatmeal Pancakes! (Click on bolded words.) The addition of ¼ tsp. of nutmeg to the batter before placing the batter on the grill resulted in scrumptious pancakes. Topped with a little maple syrup – Yummy! The extra pancakes were placed in our freezer. It is always a wonderful surprise in the morning to open the freezer door and locate them! Two batches of the Blueberry Freezer Jam are now sitting undisturbed on our table. Today was also a day to make the Freezer Jam. Tomorrow afternoon (after the required 24 hours) the containers will be placed in our freezer next to the Strawberry Freezer Jam. Each batch was prepared carefully and separately. Enjoying a handful of fresh, mouth-watering, ripe, washed blueberries is part of summer. There may be some fresh berries left in our refrigerator to make Blueberry Delisimo or Yummy Blueberry Muffins. Have you had the opportunity to bake them? Share your comments with us by clicking on Comments. After blueberry season has passed, we can enjoy our supply in our freezer. Grilled Swordfish Served at Home? One evening many years ago we were enjoying delicious Grilled Swordfish Dinners at a charming restaurant while on vacation in Maine. The meal was so appetizing! While enjoying every bite, it occurred to me that Grilled Swordfish would be easy to prepare. It is very easy! Only Olive Oil and Paprika are needed. It requires the same method as preparing Grilled Sockeye Salmon. Pour about 2 TBS. of Olive Oil on a large dish. Sprinkle a little Paprika on top. Rinse the Swordfish Steak under cold running water. Then, place it on the Olive Oil/Paprika. Turn the Swordfish over to coat the other side and then place it on the hot grill. The grilling basket (container) is optional. We do not use it while grilling Swordfish. The fish is turned over one time during the grilling process. The amount of needed grilling time depends on the size of the piece of Swordfish and the grill. A 1 lb. piece requires about 5 minutes and 30 seconds on each side. Served with cold salads, dinner is ready quickly! Enjoy! Yummy! Do you remember making plans to do something and an unexpected guest arrived at your table? This afternoon during the thunderstorm we had a most unexpected guest at our outdoor table on our deck. Suddenly, the torrential rain fell. The gusty wind blew sticks out of the trees and a very huge limb landed across our deck, outdoor grill, picnic table and chairs. Yes, it was most surprising and it happened very quickly! Fortunately, everything was fine with the exception of needing the gigantic limb removed tomorrow. Usually thunderstorms move around us in our little corner of the Pioneer Valley in Western Massachusetts. Tonight we ordered out for dinner. For those of you who prepared Grilled Sockeye Salmon, Grilled Haddock or Pan Seared Scallops – do you have a favorite of the three recipes? Share your comments (click on word comments) with us. Our outdoor grill is used often during this hot humid weather. We do not wait until visiting the Cape to enjoy seafood! Grilled Haddock is easy to prepare and delicious to eat. The method of preparation is similar to preparing Sockeye Salmon when the salmon is grilled. On a large dish pour about 2 TBS. Olive Oil. Sprinkle a little Paprika and Thyme on top. After rinsing a Haddock Fillet in running cold water, place on the Olive Oil/Paprika/Thyme. Turn the fish over to coat the other side. A grilling container is definitely needed, because the Haddock will break apart while grilling. 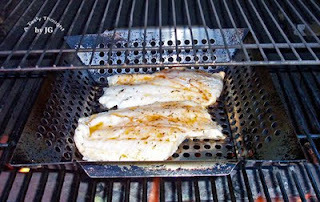 Once again, the amount of needed grilling time depends on the size of the piece of the haddock and the grill. A 1 lb. piece requires 5 – 7 minutes on each side. The fillet is turned over one time during the grilling process. So easy and so good! Have you prepared Haddock using this method? After toooo many humid days, it is so comfortable to be outdoors today! ;-) Wanting to spend more time outside is definitely an invitation to use the outdoor grill. Grilled Alaskan Sockeye Salmon is absolutely delicious! It does not need a fancy saucy topping, or any salty addition. The preparation is easy which is also a plus. On a large dish pour about 2 TBS. Olive Oil. Sprinkle a little Paprika on top. After rinsing a salmon fillet in running cold water, place on the Olive Oil/Paprika. Turn the fish over to coat the side with skin. For grilling we use a metal grilling basket (container) to grill fish. By using it, no pieces fall into the grill. 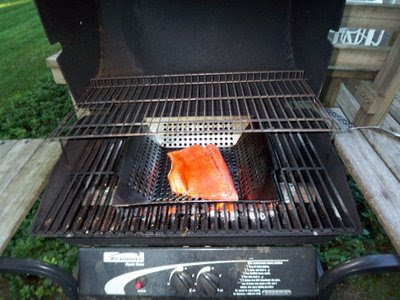 The amount of needed grilling time depends on the size of the piece of salmon and the grill. A 1 lb. piece requires 5 – 7 minutes on each side. The fillet is turned over one time during the grilling process. Grilled Sockeye Salmon is definitely a healthy favorite of ours. Served along with a microwaved "Baked Potato", sauteed Summer Squash and sauteed Zucchini (Sauteed Combo) dinner will be eaten quickly. Yummy! Have you prepared Sockeye Salmon using this method? How did your family enjoy it? 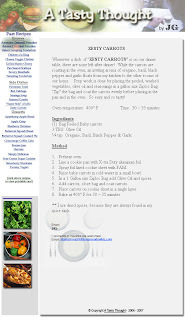 The Sauteed Combo (click on bolded words) can be enjoyed any time during the year, but tastes best in the summer. Zucchini and Summer Squash are now available at our local Pioneer Valley roadside vegetable stands. Local fresh produce to enjoy during the summer in Western Massachusetts served along with grilled seafood! Sunday afternoon was humid following four days of cloudy, wet weather. Rather than use our outdoor grill for dinner, I decided to use a small kitchen appliance that I often use during the frigid cold snow filled winter months. The reliable Slow Cooker was taken out of my cabinet. My West Bend Slow Cooker is similar to a crock-pot. Its nonstick container sits on an electrical base and slowly cooks scrumptious meals as a fragrant aroma permeates throughout our home. Herbed Saucy Chicken was easy to prepare! After everything was placed in my slow cooker to cook, I worked on another project. The preparation was simple! About one and one half pounds of boneless, skinless chicken breasts were rinsed with cold water, cut in half and then placed on the bottom of the slow cooker’s container. I sprinkled the desired amount of Oregano, Basil, Garlic Powder and Black Pepper on top. A little Chopped Onion and Parsley was added along with two Bay Leaves. One drained can of 14 ½ oz. Diced Tomatoes was placed on top of the Chicken. Then, one 24-ounce jar of Spaghetti Sauce was poured on the top. After the lid was placed on the Slow Cooker’s container I set the temperature on #5 High for 1 hour. After one hour, I reduced the setting to #3 for two and one half hours. Dinner was taking care of itself. 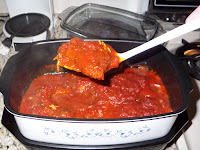 I use the slow cooker when I am working on other projects at home. Later, this mouth-watering meal was served over “No Yolk Noodles”. A summer salad and Parmesan Toast complemented our meal. The chicken was very tender and so delicious! My husband rated our dinner two thumbs up! Yummy! The Fourth of July! As we celebrate our independence we also have summer barbecues. Along with the grilled hamburgers and the hot dogs a few delicious side dishes are enjoyed. Our family has our "family favorites." They include Carrot Salad, A “Super Side” of Jello and Tangy Tortellini Salad. (Click on bolded words.) Each "easy to make" dish is prepared one day in advance and then refrigerated. A fruit salad can be prepared on the day of the BBQ. They are all kept cold on the serving table. If there are any portions left after we have eaten, they are carefully covered and refrigerated, again. Later in the evening or the next day it is always a pleasant surprise is to open the refrigerator door and discover a small portion of your favorite delicious salad. Yummy! It definitely is the season for a B-B-Q! On Monday Super Side of Jello will be found on our table with the other salads and the condiments. This easy side dish is made the day before you plan on offering it to your guests. Without a doubt it is a family favorite for us! Enjoy! The season of graduations and outdoor celebrations is here. It requires a delicious assortment of finger foods, entrees, snacks and accompanying beverages. At our gatherings a family favorite for all ages has always been Sherbet Punch. Sherbet and 7-Up Diet soda are the two ingredients. Whenever we had a celebration this beverage was present. The children, who are now adults, would look forward to seeing our punch bowl filled with foaming, floating, softened orange sherbet. The disposable cups and punch bowl ladle were ready to be used. The first time that my family enjoyed this beverage was when our oldest son graduated from the fourth grade and it was served in the cafeteria after the ceremony along with cookies. We enjoyed it so much that at our Holiday Buffet the following December our punch bowl was filled with Orange Sherbet Punch. To this day the young adults remember our large punch bowl filled with the orange frothy delicious mixture. In a large punch bowl place 1 Quart of Sherbet. Then pour (2) bottles of chilled 7-Up in the punch bowl, pouring some over the sherbet. Stir a little to mix the ingredients. It will result in a frothy top and softened sherbet. Ladle into cups adding some of the softened sherbet. Enjoy!!! Replenish the 7-Up and sherbet as needed. There are only two containers of Freezer Jam remaining in our freezer – one container of Blueberry Jam and the other is Strawberry Jam. Every year during the month of May, I purchase the Certo and the 8 oz. Ziploc Containers for the preparation of the upcoming batches of jam. Making jam was always a summer activity when I was growing up. However, jam was only prepared by stirring the mixture over a hot stove in the heat of the summer. Years later, the process of making homemade jam became so much easier. The directions for Freezer Jam were included in the Certo box. That first summer I gave it a try by following the directions exactly. Sugar was added to the washed crushed berries/fruit and stirred. The fruit mixture “sat” in a large bowl for 10 minutes and a combination of lemon juice and liquid Certo was added to the fruit mixture and then stirred for 3 minutes. 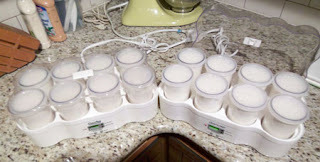 Then the mixture was placed in the washed and dried Ziploc Containers and the lids were placed on the top. After adding the label, the prepared jam sat on my dining room table for 24 hours, just as the directions stated. Then, it was placed in our freezer to be stored and to be enjoyed at a later date. 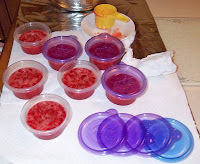 Making that first batch of Freezer Jam proved to me that the much easier process was the method to use. 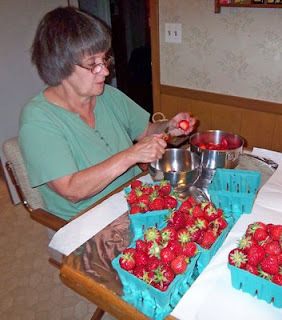 When the strawberries ripen in our local area it will be time to make Strawberry Jam. Following that will be Blueberry Jam and then Peach Jam. This jam is absolutely delicious as a flavoring for Yummy Yogurt or on toast. Follow the directions exactly! It is scrumptious!!! Are you searching for a delicious, exceptional and easy to bake dessert for your mom for Mother’s Day? Surprise her with a dessert that you have baked in your oven rather than one purchased in a bakery. The dessert will be special, because you have spent the time deciding what to prepare and then followed through and baked it. I have many suggestions for you. Blueberry Delisimo is prepared with fresh or defrosted blueberries. Topped with a small scoop of vanilla ice cream it is absolutely delicious! Do not be fooled by its appearance before it is baked in your oven. Hermits are definitely a New England favorite. These molasses cookies are filled with raisins. Cranorange Coffee Cake is one of our family’s favorite desserts. Topped with a small scoop of vanilla ice cream Apple Crisp is served any time during the year. A combination of Granny Smith, Empire and/or Cortland apples results in a yummy dessert. Any of these desserts will be appreciated. Each one is delicious. Enjoy baking your choice! Awesome Oatmeal Pancakes are light, nutritious and delicious! These yummy pancakes are made in two easy steps. Last night, I prepared Step 1 in the process of making the AWESOME OATMEAL PANCAKES for our breakfast this morning. After completing Step 2 this morning, I poured the batter onto my griddle and added a few BLUEBERRIES on the top of each pancake. What a scrumptious addition! Served with a little maple syrup this is a wonderful breakfast. I am continuing my quest to lower my cholesterol level even more and still eat a breakfast containing oats every other day, because it has worked for me. Rather than use whole eggs in this recipe, I also substituted Egg Whites. So … I used 4 Egg Whites, remembering that 1 Whole Egg equals 2 Egg Whites. We did have extra pancakes - After the leftover pancakes cooled, each pancake was placed in a “sandwich bag” and then they were placed in a gallon sized “Ziploc Freezer Bag”. Our freezer contains another delicious breakfast of BLUEBERRY OATMEAL PANCAKES! My new recipe for today is ZESTY CARROTS. These delicious vegetables can be served for dinner with one of my family's favorite entrees PAN SEARED SCALLOPS. While the carrots are roasting in the oven, the scallops are prepared on top of the stove. Add micro-waved "baked potatoes" and dinner will be ready quickly. If you have some time before dinner, prepare a dessert and add an extra surprise for your family. Check out all of my favorite dishes at A Tasty Thought at LongmeadowBiz.com. A grilled cheese sandwich using cinnamon raisin bread is absolutely delicious! The sandwich remembered from childhood with a sweetened flavor. Keep a loaf of cinnamon raisin bread in your freezer. The needed slices of bread can be defrosted and used to make this quick tasty sandwich. A bowl of hot Creamy Cranberry Oatmeal tastes delicious on a cold morning. Yes, I use the old fashioned oats when I cook. Using the recipe on the oat container, place the required amounts of “old fashioned oats”, milk (rather than water), “apple juice cranberries”, cinnamon, and brown sugar in a pot and let sit for 10 minutes before preparing on the stove. Then, I usually set the timer for 8 minutes and start cooking and stirring. By following this method I have learned that the oatmeal is creamy after it is cooked. In my refrigerator a 1 cup Ziploc container containing dried cranberries soaking in apple juice and another container of apple juice raisins will be found. This is a delicious breakfast! 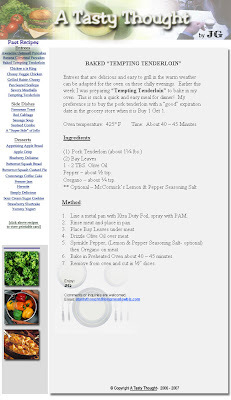 Here is my latest recipe.... I always take advantage of Big Y's Buy 1- Get 1 promotion of pork tenderloin. Select about 1.3 lb pieces of the cryovac wrapped tenderloin with "good" expiration dates - that is dates that are two weeks into the future. One is baked today or tomorrow and the other is placed in the refrigerator to be used at least four days before the expiration date. Each tenderloin should feed a family of 4- with probably no leftovers. If there are any, the next day my husband enjoys any leftover pieces in a wrap combined with taco cheese.